The Bagpipe Gauge. | Learn quickly to blow your pipes strong and steady. The Bagpipe Gauge is a revolutionary tool that quickly teaches you how to blow your pipes strong and steady. Guaranteed. Now with a brand new design with a full color display and improved custom attachment strap. "...the results in just 2 days of using it have been astonishing." Do you want to know how to achieve that rich, harmonic, rock steady, precisely-tuned, world-class bagpipe sound? Every top piper knows that great bagpipe tone begins with steady blowing. The Bagpipe Gauge is easy to use and intuitive. It gives you precise, instant, and continuous visual feedback. The Bagpipe Gauge is completely portable and takes just seconds to attach. 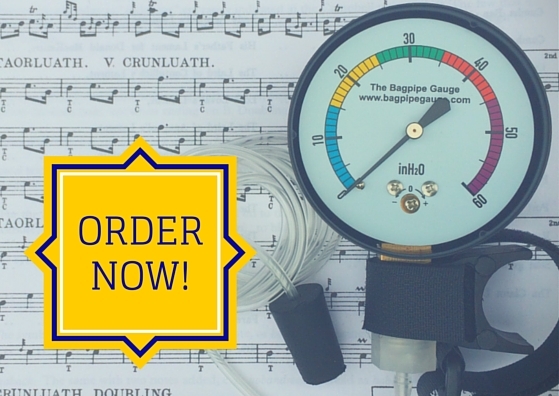 The Bagpipe Gauge will completely change the way you think about blowing your pipes. "The Bagpipe Gauge has REALLY helped the pipers of Alaska Celtic Pipes & Drums to improve their consistency of maintaining steady bag pressure, with a very noticeable improvement in tone at practices and gigs, within 2 weeks of our Band initiating their use. Instead of some arbitrary tone target that pipers might be told to reach in “blowing tone,” and which they may or may not fully appreciate whilst playing, the Bagpipe Gauge provides a clear practical benchmark for each piper to work on, in his or her daily practice routine. Our younger and older pipers alike are finally starting to “get it,” because they can readily see when their number starts to waver on the Gauge, and take corrective action to keep it steady. This also makes tuning the Band much quicker and easier, as pipers are more consistent in maintaining steady bag pressure, and we have that much less variables to fix. Jori knows what he’s talking about! Our Band HIGHLY RECOMMENDS the Bagpipe Gauge to any piper or Band that wants to improve their tone and playing."